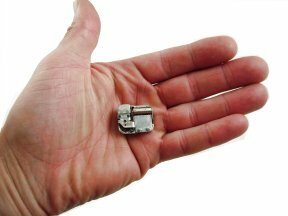 This miniature 17 note musical movement is hand made and one of the smallest, real mechanical musical movements in the world measuring just 24 mm long. The picture shows a real 20 pence piece alongside to give a better perspective of it's tiny size ! Perfect for anyone wishing to make their own 'real' musical locket or miniature music box.